Conversations are the new Leads. A fully-functional system for managing all your connections, leads, clients, and beyond. Easily record and review notes and conversation history with your contacts. Maximize your time by cherry-picking your most qualified leads for follow-up via phone, text, and email. Call-Assist helps you power through your list – record call outcome, schedule the next callback, and move on with one click! Leads are useless without personal conversation. Dialogue helps you learn their specific needs and move them toward becoming a client. It’s way more effective than one-way email or text updates. But do you have the time to chase every lead for one-on-one conversation? Wouldn’t it be easier if you could get them to contact YOU? If you’re averaging $5 to generate a lead, and only talking to 10% of them, that’s $50 per conversation. Raise that percentage to 50% and a conversation costs you only $10. AND more conversations means more clients! Creating more conversations boosts the effectiveness of ALL your other marketing and advertising. That’s HUGE! 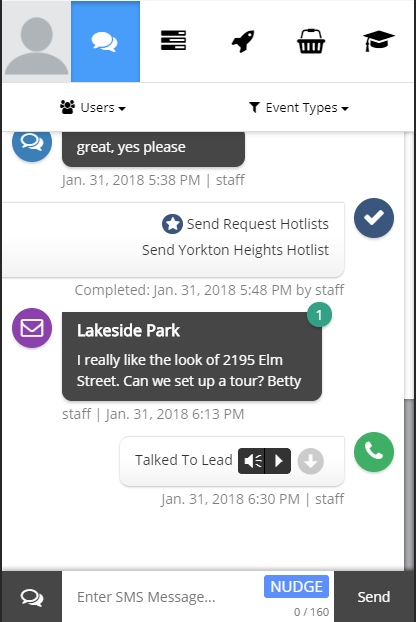 Conversation Engine integrates with many popular online advertising and lead capture platforms, including Facebook, Google, Zillow, and Realtor.com. You can also add lead capture forms directly to your website. Manage your own lead generation campaigns, or leverage our team of experienced Google and Facebook specialists to get the leads for you. Autonomous conversation sequences do the work to open dialogue and nudge leads to contact YOU. Pre-program your customized sequence across email and SMS using our templates or your own content. Easily record ringless voicemail messages in your own voice with crystal-clear audio quality. When leads respond, Conversation Engine stops the automated sequence and hands the conversation over to you. 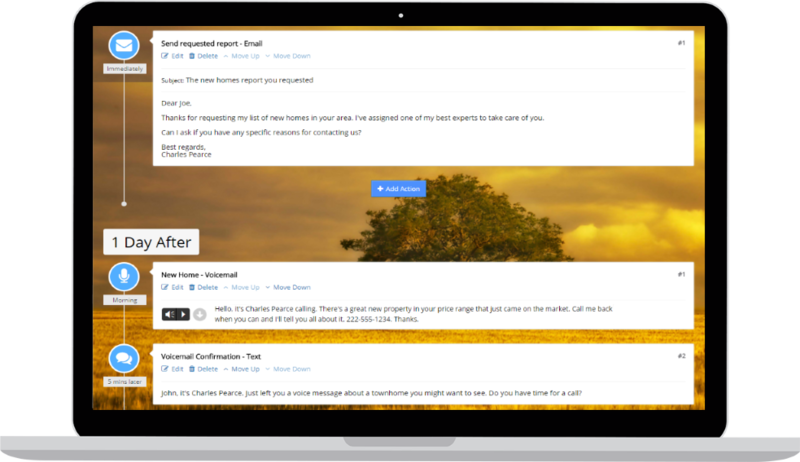 Reply immediately from your lead notification email via multiple channels, and continue the conversation! We frequently see response rates of over 50%! 4. Follow up with ALL your leads... ALL the time. Ready to try calling your non-responsive leads? Manual follow-up just got a whole lot easier! Complete Conversation History is recorded in each lead record. View at a glance everything the lead has received and how your conversation unfolded. Record your calls to share information or improve your phone technique! Assign leads and tasks to team members, manage progress and share results. Supercharge your follow-up and create even more conversation opportunities with our EXCLUSIVE MLS Listings portal (available as a separate paid option). 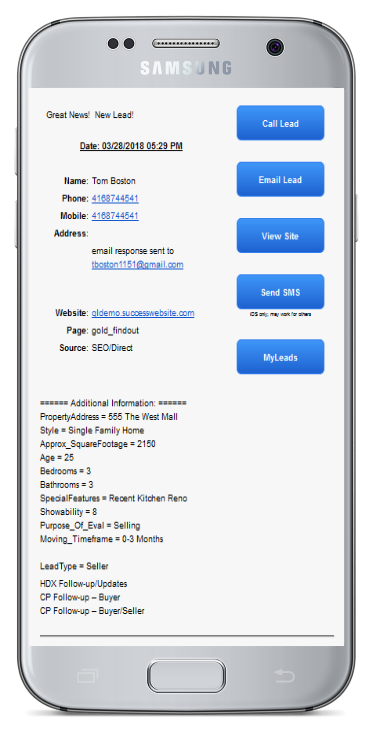 Let your leads search the MLS, subscribe to pre-defined lists of properties, and automatically receive updates for new and modified properties. Nudge leads to contact you through savings product reviews and other information. Spread the word quickly when favorable interest rates become available, or when important tax deadlines are coming up. Guide potential clients through their legal issues by providing tips and information. Help them organize. Save valuable time by letting conversation sequences qualify leads for you. Callbacks, Appointments, and Deadlined Tasks all appear on your calendar. Two-way sync with Google Calendar ensures appointments are visible on your daily schedule. 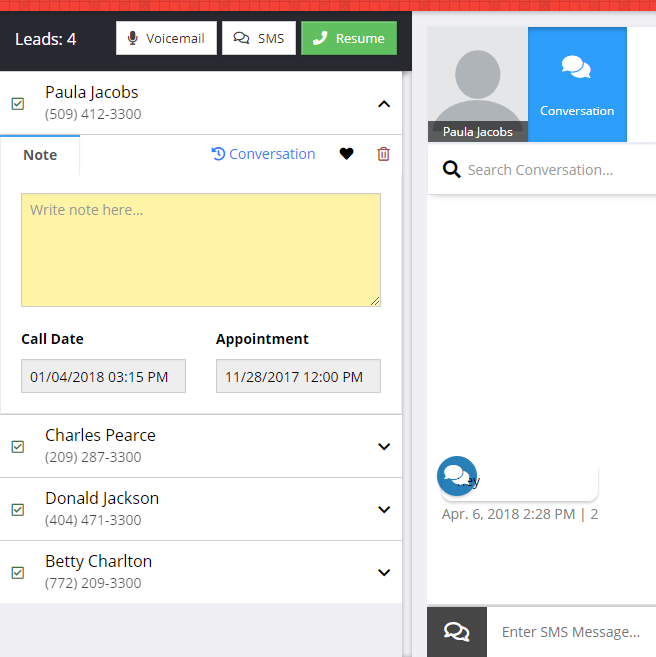 If you're calling leads, schedule Call Blocks to auto-load leads into dialer. First account $25/month, then $10/month per extra account. EACH User Account includes its own conversation sequences, Action Plans and Call-Assist features. “Nudge” is the colloquial term for the various communication actions you can initiate with the Engage Conversation Engine. 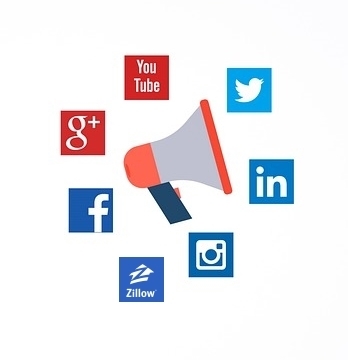 These multi-channel messaging actions leverage technology with social behavior research, compelling more responses from your leads. Nudges can be sent or received manually, using our Call-Assist features, or as part of an automated Conversation Sequence or Action Plan. For billing purposes, Nudges are a “currency” reflecting the cost of each action. For example, you are charged 1 Nudge for any single phone call (per 10 minutes duration), text message (via SMS), ringless voicemail drop, or outgoing email. As a premium data service (including your ability to send photos), text messages via MMS are charged 2 Nudges. You can use as many Nudges of each type as you feel is most effective, up to your total monthly Nudges allowance. For the “Pay-per-Use” plan, you’ll be billed for the total Nudges used in the applicable billing period. Consult our Usage & Billing Policy for complete information. What happens if I go over my monthly Nudges? If you pass your monthly allowance, you will be charged a small fee per additional Nudge until the beginning of your next monthly billing cycle. You can also change your plan at any time. There are no long-term contracts and you’re never locked in. Unused Nudges do not rollover to subsequent months and are non-refundable. If you wish, you can use the EngageCRM settings to set a monthly Nudge Limit, beyond which any autonomous Nudges will be paused. What can we do with separate user accounts? Separate user accounts allow different team members to converse with leads and still let everyone view the conversation. You can also share and assign leads and follow-up tasks among different users. Conversation sequences can include Nudges from different team members, and leads can respond to specific members. Note that your monthly Nudges are shared among all users. Complete this form and we’ll contact you to get started. We’ll confirm everything with you before you are charged anything. Some EngageCRM content is only available to qualifying active Craig Proctor System and Coaching Members in good standing. Copyright © 2019 ConsulNet Computing Inc.